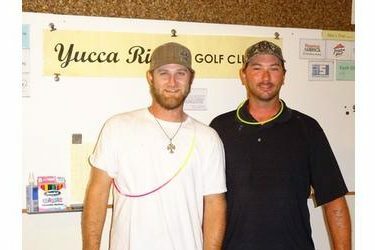 Yucca Ridge Golf Club held its ninth annual “GloBall” night golf tournament last Saturday night. This two person, scramble format event featured nine holes of golf played during the day, a break for dinner, and then nine holes played at night under a three-quarter moon. The team of Levi Eaton and Kolt Hayes won the event, shooting a 39 during the day and a 39 at night to finish with a 78 on the par 70 course. Rick and Stella Taylor shot 84 to finish in second place. Two teams tied for third shooting 85 for the night. "It was a beautiful night," said Supt. Trent Kitch. "Everyone had a great time with no threat of stormy weather this year." The next event at Yucca Ridge is Saturday, July 25th. The "Mulley" is an individual event and after each shot a player can choose to take another shot, or a mulligan. If a player chooses to take the extra shot, the player must play that shot. "Yeah, it makes you think about whether or not the risk is worth the reward if you play a new shot,” said Kitch. For information about golf or to sign up for a tournament you can call Kitch at 482-0243, or call the office at 624-GOLF.